The JV-35 Amplified Desk Phone is an analog desk phone that features up to 37 dB of amplification, which will allow the user to enjoy a clear and easier to understand conversation. This phone can be easily converted into a VoIP solution by utilizing an Analog Telephone Adapter. 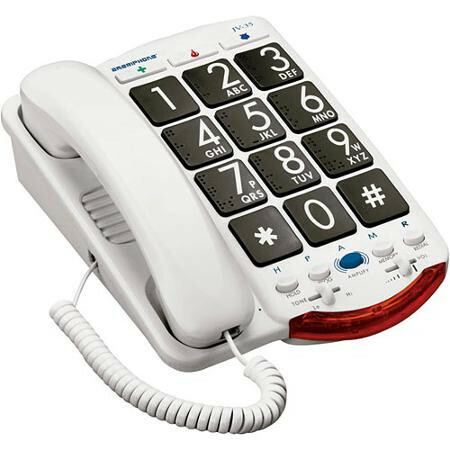 The JV-35 Amplified Desk Phone gives you the ability to adjust the phone volume up to 37dB, and also allows you to either wall mount or desk mount the phone. The JV-35 is unique due to the fact that it has Talk Back capabilities, meaning that it will audibly state the numbers being dialed to the user. Also featuring Recording Emergency Button Identification Announcements, this phone allows the user to program their own emergency identification announcements. Another programmable feature of this unit is its ability to accomodate memory dialing.